How does insurance cover damages caused by a fallen tree? High winds, heavy snow, and the general extreme weather that comes with a Canadian winter can, unfortunately, cause damages to your home. One of the culprits that can cause home damage in winter is trees or limbs that fall from either your's or your neighbour’s property. And, as unfortunate of an occurrence that would be, there is a silver lining; luckily home insurance is there to cover the cost of any damages. There are of course some stipulations, so keep reading to find out how you are covered if your home falls victim to a rouge tree or tree limb. Does it matter why it fell? As we mentioned above, there are some stipulations, so you may be asking what they are. Well, for your home insurance to cover the damages caused by a fallen tree or tree limb(s), the cause as to why the tree fell needs to be examined. As a general rule, if the tree was healthy and in excellent condition, yet falls thanks to extreme weather conditions, you are covered. However, if the tree shows obvious signs of rot and the damages could have been avoided by removing the tree, you may be left paying for repairs out of pocket. Is clean up covered by insurance? Now, what if the tree falls and there were no damages to your property, but a significant and most likely expensive cleanup to be done? If the clean up is related to any property damages, then it will be covered, but if there are no damages then, unfortunately, your insurer is not required to cover clean up costs. What if your vehicle suffers damages? So, what if it’s not just your home that gets damaged, but also your vehicle? If your vehicle suffers damages from a fallen tree as well as your home, you will have to submit two different claims, one to your home insurer and one to your auto insurer. However, to receive any compensation from your auto insurance company, you must have either comprehensive or perils coverage active on your policy. Unfortunately, without that extended level of coverage, you will have to pay for either repairs or a new vehicle out of pocket. Does it matter whose property the tree falls from? Fortunately, and unfortunately, it does not matter whose property the tree fell from, the person whose property is damaged is the one whose home insurance is used. 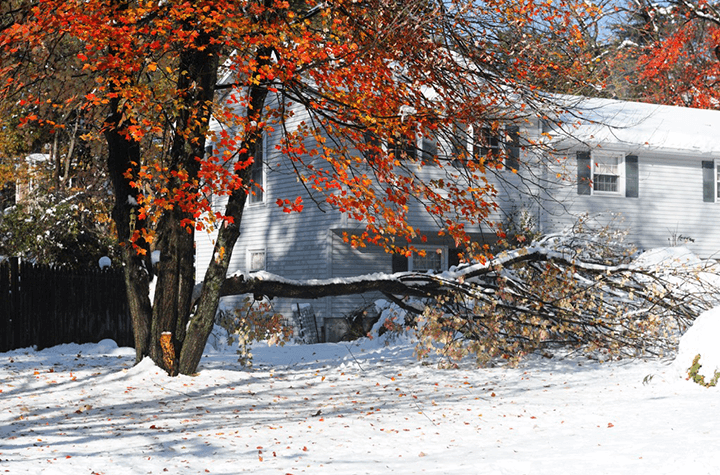 So, if your neighbour’s tree falls on your property, the damages would be covered under your home insurance policy. The same works in reverse, if your tree falls on their property, their insurance would cover them. Hence the “fortunately and unfortunately” view on the matter. The main issue with this process is if the tree is deemed unhealthy and your insurer refuses to cover the damages. It is best to be proactive to avoid a situation like this and speak to your neighbour if you feel like their tree could pose a threat to your home.